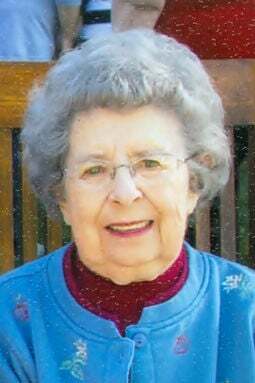 Elaine P. Vlach, age 95, of Fremont died Sunday, April 7, 2019, at home. Elaine was born Sept. 18, 1923, in Colfax County, Nebraska, to Frank and Pauline (Svoboda) Mastny. She attended rural school district No. 59 in Colfax County and graduated from Clarkson High School in 1940. In 1944 she went to work at the Martin Bomber plant in Omaha. On April 21, 1945, Elaine was married to Dennis Vlach in the New Zion Presbyterian Church in Clarkson. They lived in Omaha and Fremont before moving to a farm near Clarkson in 1966. There she was employed at Gardenland Nursery. She also worked at Douglas and Lomason in Columbus. In 1955 they retired to Fremont and enjoyed fishing and boating with their family. Elaine enjoyed gardening and growing many beautiful flowers. Elaine is survived by her son, Ronald of Fremont; a stepgranddaughter, DeOndrea and husband Tim McInroy; and two great-grandchildren, Talia and Parker McInroy. Elaine was preceded in death by her husband, Dennis Vlach; her parents, Frank and Pauline; and sister-in-law, Helen Mastny. A graveside service will be 10:30 a.m. Friday, April 12, in Memorial Cemetery in Fremont.